The Concept2 Online Logbook allows you to record your workouts on the Concept2 indoor rower, SkiErg and BikeErg. You can keep track of your total meters, analyze your progress, take part in challenges, and compare your results against others worldwide. Keep a full history of all your workouts, as well as summaries, statistics and workout analysis. Rank your best workouts and see how you stack up against the rest of the world! We have a number of challenges throughout the year to help keep you motivated. Our Million Meter Clubs provide distance goals to keep you fit for the long term. No matter how long it takes you to get there, we promise to recognize your achievement! Add users as training partners in order to see each other's workouts and help provide support and encouragement. 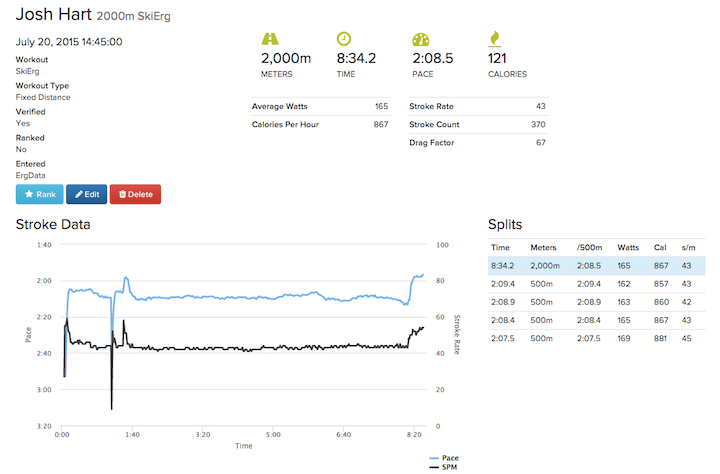 As well as entering workouts manually, you can use our free app ErgData, which connects to the Performance Monitor and sends across all your workout data. Broken your personal best and want to shout it to the world, or just looking for some encouragement? Either way, you can use the Logbook to share your workouts with your friends.